Sweet potatoes are said to be very nutritious as they contain some essential vitamins such as vitamin A and vitamin C among others. In the last few years, sweet potato fries have become quite trendy and popular as they are a healthy alternative to normal potato fries. 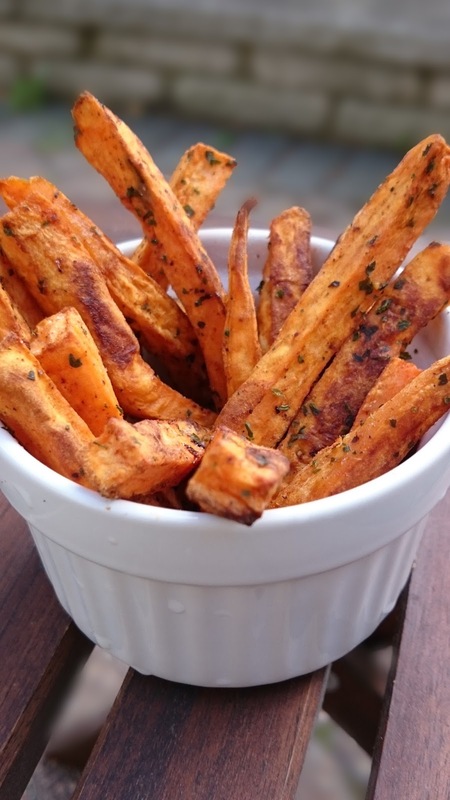 I think sweet potato fries are much tastier anyway and even if I hadn't known they were healthier, I would still choose them over normal fries any day (that rhymed! :) ). In restaurants, however, these are mostly fried, making them not so healthy. So at home I bake them and, trust me, they taste better than the greasy ones! Preheat the oven to 200 C. Combine all the ingredients in a bowl, tossing well so that the sweet potato pieces are well coated with the oil and seasoning. Spread onto a baking tray in a single layer and bake for 20 - 25 minutes. Cooking time may vary from oven to oven so check on the fries after around 15 minutes and keep an eye on them so they don't burn.